We have performed a complete analysis of 54 months of BAT survey data in the 15-30, 15-70, 15-150 keV bands (Cusumano et al. 2010, A&A 524, A64). The data sample we used covers 50% of the sky down to a flux limit in the 15-150 keV band of 1.0E-11 erg cm-2 s-1 and 9.2E-12 erg cm-2 s-1 for |b|<10� and |b|>10� respectively. The minimum detection limiting flux is not fully uniform on the sky. The map below shows the limiting flux in Galactic Aitoff projection, with the ecliptic coordinates grid superimposed. The Galactic centre and the ecliptic plane are characterized by a poorer sensitivity because of high contamination from intense Galactic sources and to the observing constraints on the Swift spacecraft. The highest flux sensitivity is achieved close to the ecliptic poles, where a detection flux limit of ~6.2 � 10-12 erg cm-2 s-1 is reached; the lowest flux sensitivity is in the region of the Galactic centre with a detection flux limit of ~3 � 10-11 erg cm-2 s-1. 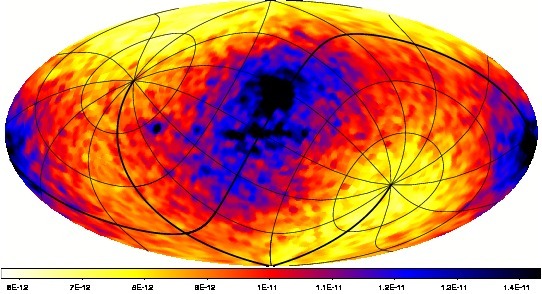 Map of the 54-months survey limiting flux in the 15-150 keV band in galactic Aitoff projection, with the ecliptic coordinates grid superimposed. The scale on the colorbar is in erg cm-2 s-1. The catalogue obtained by cross-correlating and merging the lists of excesses detected in the three energy bands contains 1256 source candidates. For each of them, we have searched for counterparts at lower energies using two different strategies. First we have analysed archival soft X-ray observations covering the position of the BAT excesses, applying count rate thresholds to select the most likely counterparts. With this strategy, we have been able to associate 920 BAT excesses with a single softer counterpart; for 8 BAT excesses, we found two possible counterparts. The BAT excesses lacking any association after strategy A were cross-correlated with a list of possible counterparts compiled by merging several source lists (X-ray binaries, cataclysmic variables, supernova remnants, pulsars, cluster of galaxies, different classes of active galaxies, already known soft X-ray and gamma-ray sources). This second strategy enabled us to associate 151 BAT sources with counterparts (18 with a double association, 2 with a triple association). The final catalogue contains 1079 BAT sources with at least one associated counterpart and 177 unassociated sources (~14%). Map of the sources detected in the BAT survey data with BatImager. Different colors denote different object classes, as detailed in the legend. The size of the symbol is proportional to the source flux in the 15-150 keV band. The remaining unassociated sources detected with the BatImager in the 54-months all-sky map are uniformly distributed in the sky. An identification campaign of these source candidates with Swift-XRT through the fill-in target program is in progress. Swift-BAT all-sky monitoring: transient phenomena with timescales from days to months.